The Cayuga was breed in North America and is used to harsh conditions. 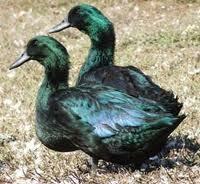 They are a hardy breed and both the drake and duck have a good temperament and are quiet. When they first lay the eggs can be completely black. The ducks do not remain black for all their life and often produce white feathers. A beautiful looking duck with iridescent sheen on their black feathers. They have a lovely soft quack and like most ducks tend to be very low maintenance. The Cayuga was breed in North America and is used to harsh conditions. 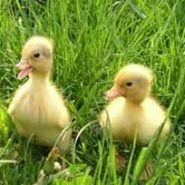 They are a hardy breed and both the drake and duck have a good temperament and are quiet. When they first lay the eggs can be completely black. The ducks do not remain black for all their life and often produce white feathers. A beautiful looking duck with iridescent sheen on their black feathers. They have a lovely soft quack and like most ducks tend to be very low maintenance. They have the reputation as being the tastiest of all the domestic ducks. This breed takes its name from Lake Cayuga in New York State. Some people believe the Cayuga is descended from the wild black duck while others believe it’s a result of hybridization with wild mallards. It was first standardized in Britain in 1901. Its main appearance is very similar to that of the smaller black East Indian: black plumage with brilliant green iridescence. 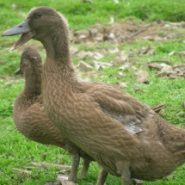 The drakes tend to retain their black plumage but the females develop white patches as they get older.The Cayuga is a heavy breed with drakes weighing: 3.6kg (8lb) and the ducks weighing: 3.2kg (7lb). When the ducks are in full lay you can expect between 50-100 eggs per year. With the exception of the Muscovy, all domestic ducks are believed to be descendants of the mallard To keep domestic ducks it is not necessary to have a pond, although it is advisable to have a suitable water container in which the birds can bathe and mate. Consideration should be given as to how the water is changed – there are plenty of wide shallow plastic troughs available which can easily be emptied and moved around to prevent one spot becoming too muddy. One advantage of keeping domestic waterfowl rather than wildfowl is that the birds are likely to take more readily to being shut away in a house at night, reducing (but not eliminating!) the risk of predation. Be the first to review “Cayuga” Click here to cancel reply.